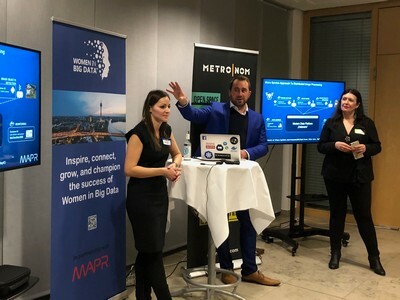 On November 29, 2018, the Düsseldorf chapter of Women in Big Data welcomed ~45 guests to METRONOM GmbH for a meet up on Big Data. Participants came from different industries and diverse backgrounds, but all share an interest in Data and seek to learn more about the technology and its impact on various verticals. The world of Big Data, AI and ML can seem rather complex and sometimes confusing. The aim of the evening was to help the audience understand the buzz around the Big data, what roles there are in AI empowered organisations, and how to position yourself in the industry. The doors opened at 18:30 o’clock and we welcomed our guests with lovely food and drinks provided by our host METRONOM. 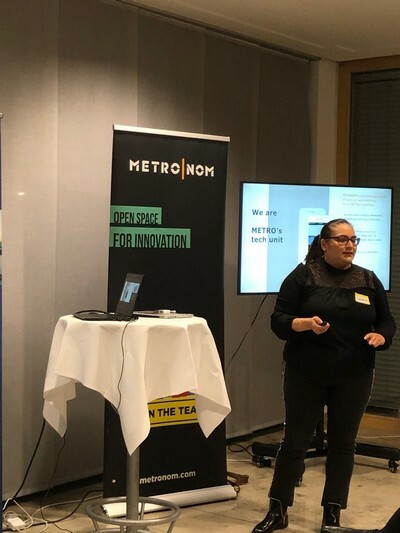 Sandrine Vinay, Employee Experience & Corporate Responsibility Manager at METRONOM GmbH, welcomed our guests and shared insights about the company. After that, Liisel Jessop gave a brief overview of the Women in Big Data Forum and the community events here in Düsseldorf. She issued an invitation for new members to join the core team, and hopefully we can soon welcome new enthusiastic WiBD supporters. The official part of the evening was kicked off by Fabian Wilckens, Head of Central Europe at MapR Technologies. His energetic talk, entitled “Promise vs Reality,” was an entertaining comparative analysis of the differences between the promise and reality of Big Data. 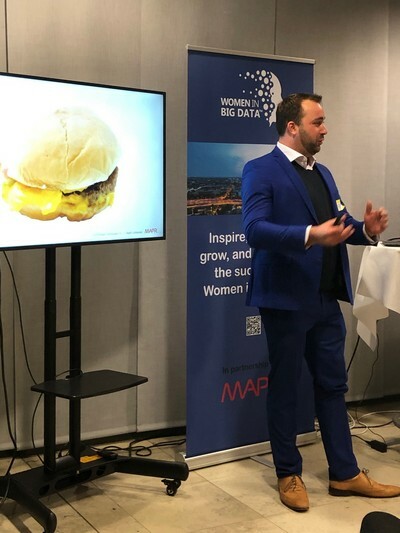 He focused on real-life examples of companies changing the world with data, and he outlined some of the latest and greatest concepts from Silicon Valley. 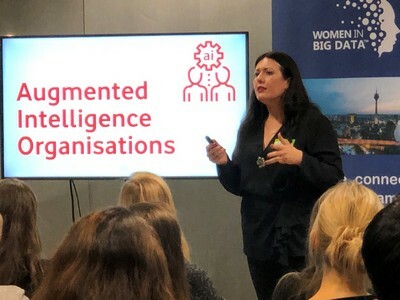 Our second speaker, Angela Maragopoulou, Global Head of IoT and UCC Operations, Vodafone Group Technology, talked about “Building an Augmented Intelligence Organisation.” In her very interesting and insightful talk, we learned about the concept of an augmented intelligence organisation and new emerging roles in it. 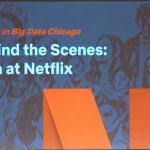 She explained how to position ourselves in this future organisation, based on our current skills and experience–and no, you don’t have to be a data scientist to be relevant in data-related job functions. 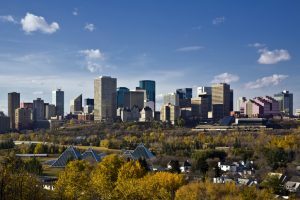 It was a futuristic view for established professionals and young guns alike. We then took a little break to enjoy more food and drinks and interesting conversation about what we’d just heard. Angela’s talk really made people think, and we had interesting discussions about who would be the sustainers, explainers, and trainers of tomorrow. 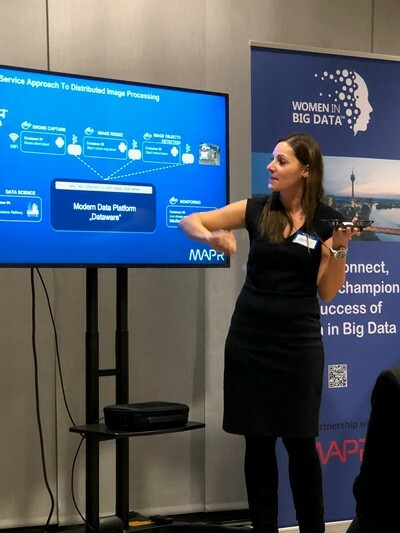 After the break, Antje Barth, Partner Engineer at MapR Technologies took over the stage–along with her drone. A smart pilot, she made the drone fly about the room and capture live data, which was then used to detect the objects. The demo was a great success: people were recognized as persons and not as chairs or other objects we had in the room. 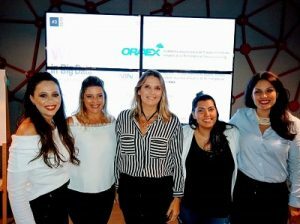 It was a very inspirational session and surely led to increased sales of drones and clicks on the script she used on github.com. We finished the evening with a panel session and an interactive Q&A about the technology and real life examples, which helped to connect the dots between the buzz words and use cases. 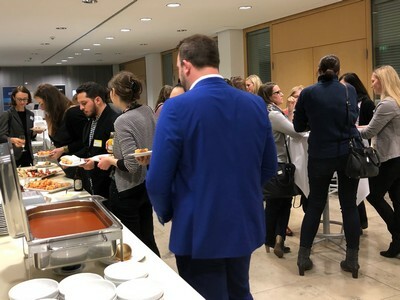 We really enjoyed the hospitality and the generous food and drink offering at METRONOM, and were very pleased to welcome both new joiners and “regulars”, as well as four male guests who seemed to enjoy the evening as much as everyone else. The atmosphere was upbeat and high on energy. The core team is very thankful for all who helped to make the evening a success and is looking forward to see you at the next x-mas special afterwork or/and meetup in February 2019.